The Iron Savior has been defeated. The threat of the sentient starship has ended and the massive warcraft has departed back to deep space, leaving the two races of man...sundered so long ago by the cataclysm of Atlantis...to dwell in peace and brotherhood. The Terranians and Calderans have united as one. But now a new, even deadlier danger has emerged from another universe. The Shadow has arisen... It doesn't get much more cosmic than this. The German power metal band Iron Savior has embraced science fiction in a way no other band ever has, creating a multi-album epic that makes Rush's old concept songs seem small. The story involves the lost continent of Atlantis, a giant living starship called the Iron Savior that has gone berserk and now an extra-dimensional invasion by the Shadow. It's the sort of thing that makes "hip" rock journalists gnash their teeth. Well, too bad for them! 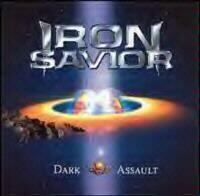 "Dark Assault" is classic Germanic power metal and definitely no major diversion from the first two Iron Savior LPs. The band includes Kai Hansen, the leader of Gamma Ray and former mastermind of Helloween, so you know you are going to get some classy heavy metal. The pace is fast, often bordering on thrash but never quite going all the way, and there are loads of those anthemic choir-like choruses. Lead guitar is all over the place and the twin leads have that "howling" sound reminiscent of Queen's Brian May at his most grandiose. "Dark Assault" would seem to complete the story of the Iron Savior, so I'm not sure where the band is headed next. If you dig immense space opera stories and like well-played power metal reeking of Helloween and Judas Priest, "Dark Assault" comes highly recommended. The song opens with a bass lick and gradual layers of guitar that build into a solid power metal song. The chorus is very typical German stuff - multi-tracked harmonic choirs. There is a good guitar duel in the middle. No, not a remake of the Metallica classic, this one is fast and hard hitting and features yet another catchy chorus. Kai Hansen sings lead here, with his more nasal approach. Piet Sielck sings lead on most of the other tracks. This song comes right out of the Judas Priest songbook, with a feel similar to "Riding on the Wind" from Priest's "Screaming for Vengeance". "I've Been To Hell" starts out as another Priestish belter but once that chorus hits, it's a lot more reminiscent of earlier Iron Savior. It is soaring and melodic but still aggressive. A lot moodier than any of the previous songs, this has more keyboard work and a very ominous, mysterious feel to it. It's a lengthy, atmospheric track. This reminds me a lot of classic Accept. It chugs forth with a very deliberate pace and the whole track is simple, no-frills power metal. This is the album's most ambitious and "different" track. It's very melodic and seems almost like a metal soundtrack. There's a lot of that wild twin harmony guitar work. This is a straight-up heavy metal rocker, with a catchy chorus. This track I felt was rather boring and pretty forgettable with its chugging riffs. It's generic Iron Savior. This starts heavily and then moves to a soft, more balladic phase before heating up again. This is a typical I.S. track and nothing to write home about. The saga of the Iron Savior concludes with this very powerful metal ballad. You will have a hard time trying to forget the bridge and chorus on this one. The song has a mournful yet hopeful feel to it, mirroring the melancholy lyrics. It is a very good track. As a bonus, the band includes this faithful cover of the Judas Priest track. It's a rocking cut but doesn't really add anything new to the song.